What’s the life expectancy in your neighborhood? Life expectancy varies greatly across La Plata County, but most areas of the county exceed the national average for life expectancy. Life expectancy varies by more than 15 years based on where residents live in La Plata County. Poverty, race, education, income, transportation, available health care, shifting demographics and access to healthful foods, among other factors, can influence life expectancy, public health officials said. While no one indicator can explain the trends, the data reveal some underlying factors contributing to the health of the community, said Sarah Hernandez, director of policy with the Office of Health Equity at the Colorado Department of Public Health and Environment. “It’s a great starting place for a broader conversation,” she said. The national life expectancy is about 78.6 years, according to the Centers for Disease Control and Prevention. Most areas in La Plata County exceed the national expectancy, except for areas in and near Durango. 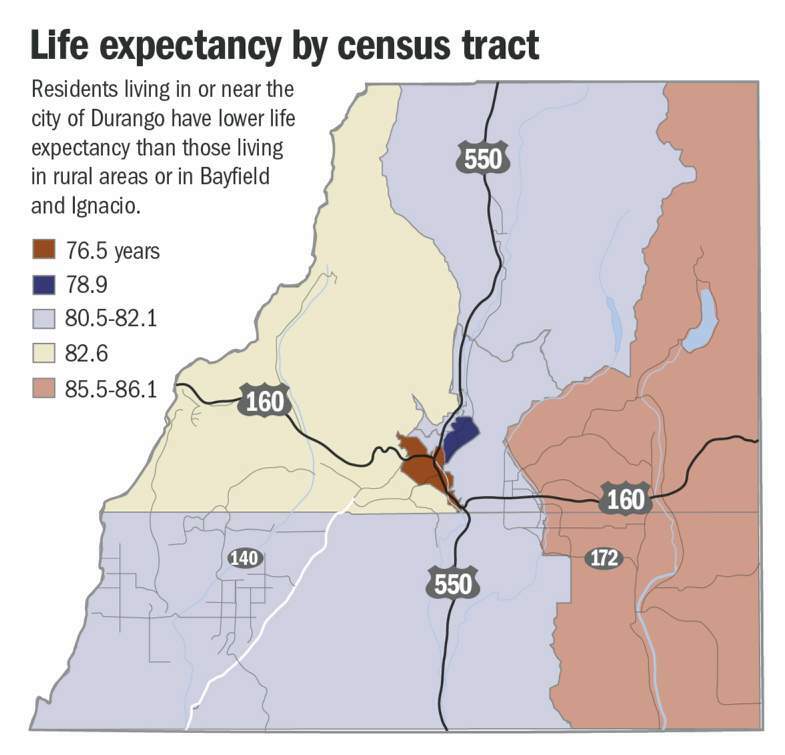 Hernandez can’t say exactly what is driving down life expectancy in some areas of Durango. The area with the shortest life expectancy, about 76.5 years, encompasses central, western and southern Durango, excluding Three Springs, according to data released by the National Center for Health Statistics. A high cost of living can contribute to residents working multiple jobs and having less time to recuperate from work, Hernandez said. Chronic stress can build in a body and wear it down, she said. The area of lowest life expectancy had the highest infant mortality rate and the highest mortality rates among those between 35 and 54, said Kirk Bol, manager of the registries and vital statistics branch of the state health department. “One of the main drivers of life expectancy is deaths among the younger population,” he said. Typically, high rates of education achievement and higher incomes independent of each other are associated with lower levels of premature death, said Amanda Jovaag, a researcher with the University of Wisconsin Population Health Institute. But life expectancy is lowest in central and south Durango, where residents are most likely to have a high school education, yet live in poverty, according state data from 2012 through 2016. Rural areas in La Plata County in general have longer life expectancies, which defies the expectation that people in rural areas would suffer from limited access to health care, Bol said. The entire Pine River Valley in southeastern La Plata County had higher life expectancies despite rates of poverty between 8.2 percent and 12.6 percent, according to the data. Southeastern La Plata County also has a higher rate of diabetes compared with other areas in the county, state data show. Many residents of the Pine River Valley have a strong connection to the land and maintain physically active lifestyles, said Pam Willhoite, executive director of Pine River Shares, a nonprofit that works to improve the region’s health. Residents in the Pine River watershed have a strong sense of independence, and in many cases, healthy relationships with their neighbors, she said. Pine River Shares works with the Southwest Center for Independence, a nonprofit that serves those with disabilities, to help prevent older residents from becoming isolated in their homes, she said. “We all live longer, feel better, are healthier when we are in each other’s company,” she said. 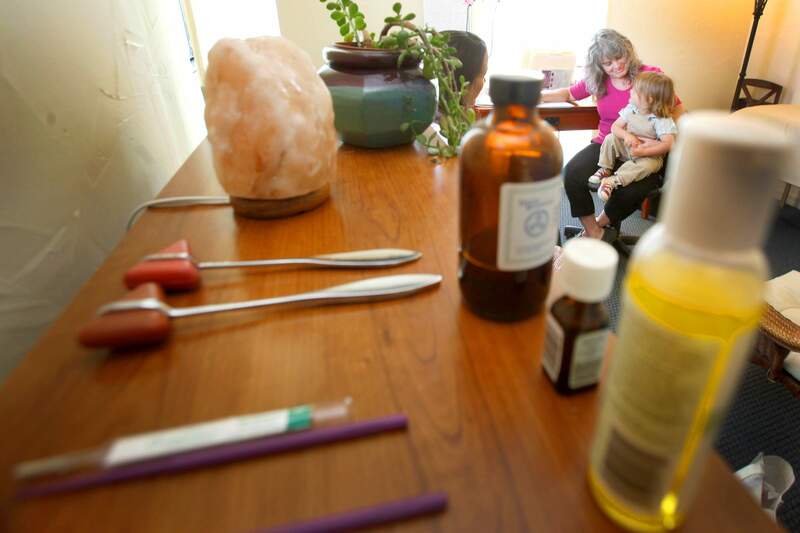 La Plata County residents are 90 percent less likely to die prematurely than people nationally, according to the County Health Rankings, a report released by the Robert Wood Johnson Foundation and the University of Wisconsin Population Health Institute. “La Plata County is an incredibly healthy county,” Jovaag said. In La Plata County, 5,700 years of life are lost prematurely per 100,000 people, which is on par with the years of life lost across Colorado, the data show. The risk of premature death is determined by calculating how many years of life are lost if residents die before turning 75, she said. The years of life lost are calculated as a rate per 100,000 people to allow comparison between counties. One of the most effective ways to decrease the risk of premature death over the long haul is to lower the rate of children in poverty, she said. In La Plata County, 12 percent of children live in poverty, according to the data. By comparison, about 20 percent of children live in poverty nationally, according to the health rankings. Schools, businesses, public health agencies and other sectors all have to work together to address childhood poverty, she said.